This Thanksgiving, I put off dinner with the family until Friday and spent Thursday working for the first time with a BBC crew. This particular shoot, part of a larger documentary, was about the 1926 Scopes trail and the ensuing controversy. The shoot went great except for a single mishap. It was an innocent mistake, but as I look back, it really made the day seem like more of an adventure! Now, while the brits don't celebrate Thankgiving, they are certainly aware that the holiday exists in the US. Despite this, it seems the production coordinators back in the UK assumed there would be an open restaurant in which to eat lunch the day of the shoot. From what I saw in the one day I was there, Dayton, Tennessee is a wonderful small town. It also, like many of the small towns around my home, does not have a single chain restaurant. The local eateries were all deserted. There was no lunch to be bought anywhere in town. I say there was no lunch to be bought. As it turns out, a local church ministry was providing Thanksgiving dinners to the less fortunate residents of the area. That day, we were certainly less than fortunate. While the Lord provided me and my international compatriots with a veritable feast, we were on our own as far as silverware. We managed to scrounge up five plastic spoons. One for each of us. 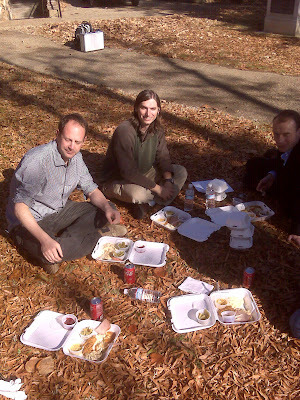 As we picnicked on the lawn of the courthouse, one crew member completely captured the irony of the moment, joking: "In these dire economic times, won't the corporation be proud of us eating at the local soup kitchen."